Welcome to REFORMATION LIVE with B. Zachary Bennett. Here we discuss life from the artist's perspective. Everything from GOD to the music industry, our society, Family, Church, Musician life, Christian living, and more. “Making beats” is the slang term for the relatively inexpensive method of composition used most often in Hip Hop music. Rap/Hip Hop artists often need “beats” to write lyrics/rhymes/melody over before going through the expense of going into the studio. A “beat” consist of a drum pattern, bass line, and a rhythm instrument (usually guitar or/and synthesizer) played in a pattern than can be looped for songwriting purposes. The "beat" is recorded to a single Wav file that can then be looped, played, and arranged as needed using several types of samplers including sampling keyboards like the Roland VSynth, special tools like the Akai MPC, or software such as Cakewalk's BeatScape. The sampled loops can then be trimmed, played like chords on a keyboard, etc. When it comes to recording a song with “beats,” they are often added to or stripped down as the song is framed. A ‘beat” can also contain samples of other completed records than can be looped for composition ie the ever popular MC Hammer release "Can't Touch This" which sampled Rick James...and of course James Brown is the most sampled artist ever. Once the artist has written rhymes and figured out how they are going to perform with the loop, they will go into the studio with a producer and work out any embellishments, arrangement changes, etc. as the song is developed. Lastly, the artist will perform over the completed song and we end up with a completed work. This method of working is popular in certain styles of music because it is inexpensive and relatively quick. There is no need for the artist to purchase instruments or equipment they don’t normally need, producers can compose “beats” at their leisure so there isn’t a lot of studio time to rent, producers are paid by the “beat”, and it's become common within the industry as a modern method of writing and recording songs. So it's a winning situation for both producer and artist. At Reformation Productions, if you would like to complete the composition with a producer after spending time writing over a beat, you can schedule time to work with them in the studio. You will work with the producer using their equipment to complete the song(s). Song composition using “beats” is $75/hour with a 4-hour minimum paid as a deposit and includes studio rental. 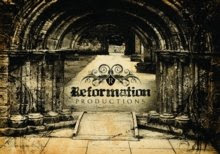 Reformation Productions; record production, live show production, original composition, video production; music for film, video, etc. For Sponsorship and Advertising Opportunities, Click Here. Kingdom Life Seminars and Workshops for your church worship team, tech team, songwriters & musicians, parents, teens, etc.